Most CMSs have 3 big problems. First, they focus on managing your website, not your content. Second, they monopolize the presentation layer, making it hard to create compelling, forward-thinking designs. Third, it’s difficult to add new channels like mobile apps and microsites without duplicating your content. We sat down with Todd Ross Nienkerk, Digital Strategist, CEO, and Partner at Four Kitchens, to rethink the purpose of a CMS, the connection between a site’s backend and frontend, and how we manage and consume content. Watch the full recording below, or read on for our short recap of Todd’s talk. More than likely, you have a content management system comprised of a frontend and a backend. For a loose definition: on the frontend, you display something in some capacity, and on the backend, you store something in some capacity. Thinking of it this way, frontends are your desktop computers, laptops, tablets, and RSS feeds. Backends are texted-based content, images, videos, user interaction, and even user-generated content. 20 years ago, websites were static, consisting of HTML files uploaded to a server through FTP. Then, in the early 2000s, there was a rise of content management systems—software you install on a web host that allows you to update content through your browser. CMSs made websites dynamic by eliminating the amount of work and time it took to update content. Today, we’re in new phase of evolution. We’re starting to wonder if the front and backend should be stuck together so closely. What if we separate them? 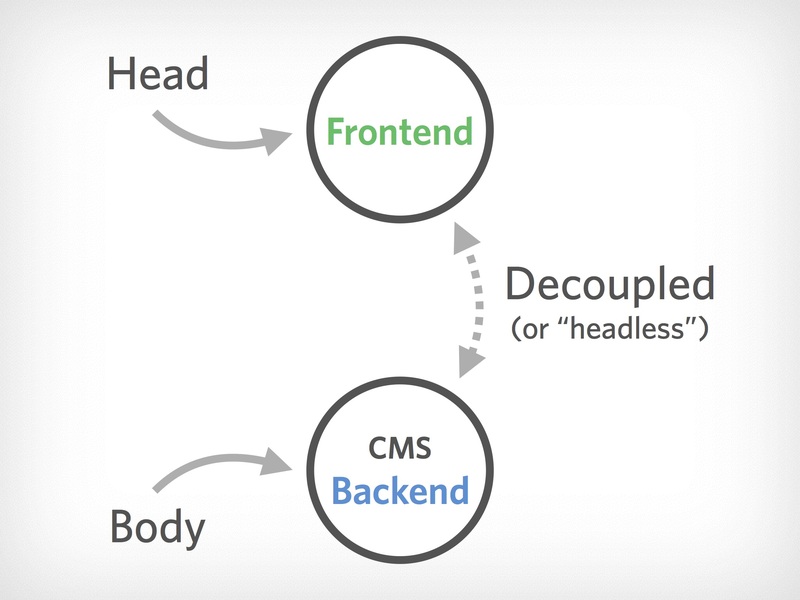 Separate the head (frontend) from the body (backend and CMS), and you make it headless, or decoupled. With this approach, you can have 2 different pieces of software. The first that powers the backend and manages the content, and the second that interprets that content and displays it in a web browser or other frontend. Right now, it’s easy to think of the frontend as just the web. But now there’s a whole host of different frontends out there, each with their own constraints. Social media: You might not think of social media as a frontend, but if you’re pulling content from your website to make a post—whether copying and pasting it or relying on Twitter or Facebook to pull in images—it’s already acting as one. Screen readers: Screen readers aren’t just for people who have accessibility issues . Now screen readers are being used for voice commands to mobile devices. It’s time to stop putting a website in the middle instead of just delivering specific content right to the screen reader. Wearables: We need to start thinking of how content is displayed on small devices as they become increasingly popular. 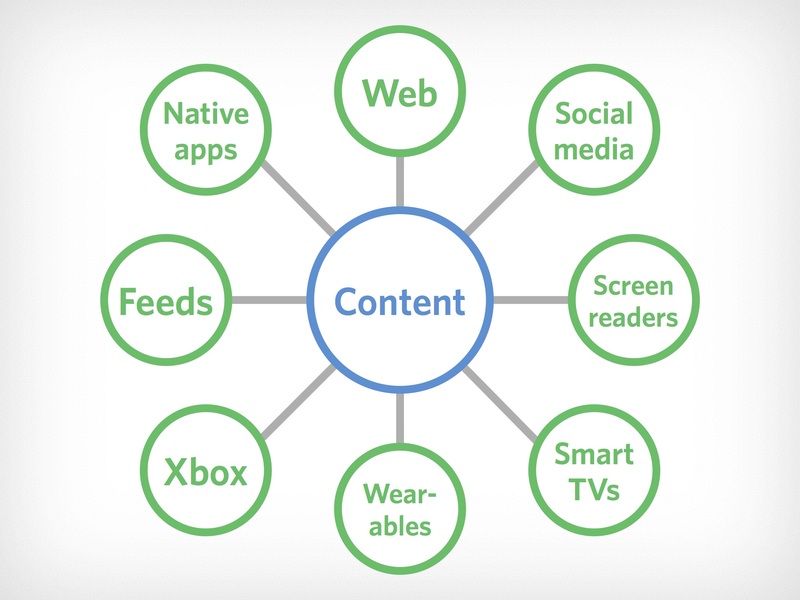 In the future, where all front-ends are equally important, we must design starting with content. For more information on when decoupling makes sense and what’s next for CMSs, watch the full recording above.